Once again, Dear Reader, I have to apologise for my tardiness and otherwise remaining silent whilst you eagerly and impatiently await an update of my recent exploits. Stay tuned, for in this exciting episode our Hapless Hero (that would be me) is propositioned by a witness in a current investigation. Given that this case is currently active, I don't wish to go into too many details. However, what I can say is that there had been a recent incident of aggravated robbery and theft of a motor vehicle resulting in an insurance claim which, when viewed in a certain light, raised even more questions. I had already interviewed the insured Mr A. Tinker and his friend Mr B Tinker (no relation and not their real names) who had been in possession of the vehicle when it was jacked. And, it turned out there was a witness of sorts. A female associate, Christine (also not her real name) had seen the vehicle several hours later at a gas station and had a good look at the occupants - who spoke to her and made an admission of the robbery. However, from the beginning, the explanation of events just sounded dodgy - such as why the victim was waiting to pick up the associate at 0200hrs on a street well-known for its problems with prostitution? 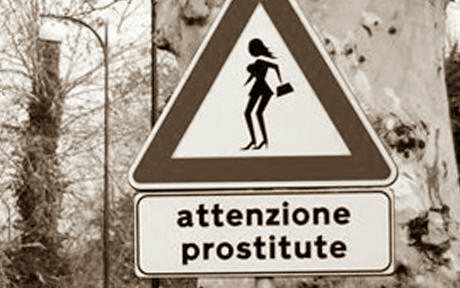 Yes, they finally admitted, Christine was a 'now and then' prostitute. She didn't regularly work the streets, just when she needed some extra cash. I manage to get hold of her and she reluctantly agrees to meet me at Tinker A's apartment. I had been in the apartment earlier and it was a fairly unpleasant experience. There was no power and the place was in a hell of a mess. Also, Tinker A clearly has a problem with methamphetamine - or so the open and weeping sores to his face and arms would attest to. Actually, that is unfair of me. I shouldn't jump to conclusions like that, it could very well be leprosy. When I return to the apartment to speak with Christine, I had to wait a good 15 minutes while she was in the bathroom. When she came out she was fully wired and tweaking. It was difficult enough getting her to focus on me and answering my questions without her fiddling with the radio and her eyes going all over the place. [Christine] Do u knw any1 who wants a hole? And this is so going into my report to the Client!